Installing 66 gargantuan antennae necessary to survey the furthest reaches of the universe from a 16,000-foot high plateau in Chile is no easy job. But this purpose-built truck's been designed to do exactly that. Gallery below. 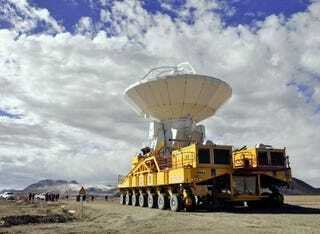 "The ALMA antenna transporter is motorised by 2 powerful engines of 500 kW each - i.e. as much as twice a Formula 1 engine - that drive individually each of the 28 wheels. These powerful engines are necessary to climb the 10% slopes that exists on the Chajnantor site and to bring the 240 tons of the vehicle and antenna from the 2900m high base camp to the observing site at 5000m altitude. The transporter has on board a power generator to keep the antenna and its cryogenic systems alive while being transported. "